Huawie latest android device Nexus 6P by Google is now on sale. Google Store is now giving Rs. 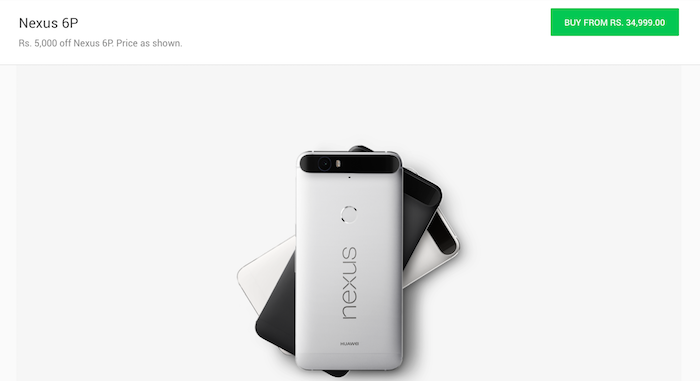 5,000 Off on Nexus 6P, Starting from Rs. 34,999 (32 GB) where as Flipkart giving the same device in Rs. 39,999 So it's better to be save Rs. 5,000 on Google store instead of Flipkart. Right now only three colors are available on google store Aluminium, Graphite and Frost, the new Gold color is not available yet but you will soon buy on Google store.